Nareit offers memberships to real estate companies operating as REITs and publicly traded real estate companies and individuals who provide support and services to REITs and the publicly traded real estate industry. Nareit brings together a diverse group of professionals sharing a common interest in real estate investment. 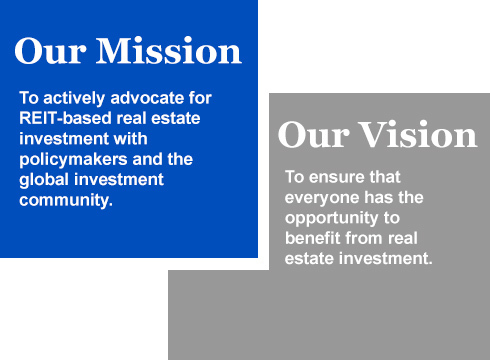 Since its inception, Nareit has diligently worked to preserve and perfect REITs by helping to shape the landmark legislation and policy decisions that have defined the evolution of REITs and real estate investment. Nareit takes seriously its role in encouraging development and adoption of effective sustainability practices in REIT-based real estate investment. Going forward, Nareit will build on its existing ESG efforts such as the Leader in the Light Awards and the ESG Forum, while also seeking out partnerships with like-minded. Just as it communicates the investment benefits of REITs to the broader public, Nareit will continue to highlight the REIT industry’s contributions to sustainable real estate ownership and operations. Nareit has created the Dividends Through Diversity Initiative to promote the recruitment, inclusion and advancement of women in REITs and the broader commercial real estate industry. This initiative seeks to achieve this mission through providing education and career development opportunities, hosting networking events and more. Nareit Discusses the important impact of REITs with Representative Judy Chu (D-CA). Nareit’s Investor CARE Awards honor those Nareit corporate members that interact most effectively with their investors on line, in writing and orally, as well as those member companies that provide those investors with the most comprehensive, clearly articulated and useful information in the most efficient manner. The Industry Leadership Award is presented to a REIT executive who has made a significant and lasting contribution to the growth and betterment of the industry.